Alternative waste management strategies for the South African wine industry’s solid waste are obligatory since the current ones, i e costly waste treatment companies, dumping in municipal landfills and onsite, as well as inappropriate composting, are neither sustainable nor environmentally friendly. 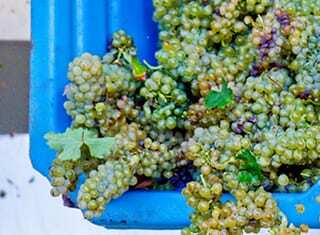 In a survey done on several wineries, waste generated through using filter powders, diatomaceous earth and perlite (filter cake) during the winemaking processes seemed to be the most challenging for some South African wineries to manage (Zingelwa-Masekwana, 2012). Guidance with regard to the minimum requirements for the design and construction of a composting facility are prescribed in the National Environmental Management: Waste Act (2008).The legal requirements for operating a compost site includes: The “Duty of Care” to the environment principles that should be implemented to ensure that the potential risk that composting activities may have on ground and or surface water contamination is avoided (Appendix 1). Generally, a site with a slope of 2 – 5% facing in a direction of the prevailing wind is preferable for composting purposes. It should be noted that water will be needed for watering, therefore, the position of the water source should be taken into consideration during the planning stages. Standard composting ingredients include grapevine pruning canes (PC), berry stalks (BS) and berry skins and seeds (BSS). Perlite, during drum filtration, together with wine lees (WFWP) (Photo 1). Diatomaceous earth, together with wine and spirit lees (WFWDE) (Photo 2). 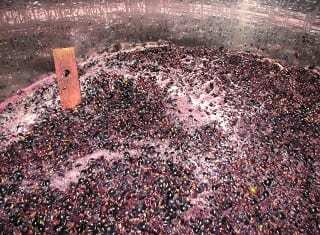 Both wine filter wastes could be characterised as having high pH values (9 to 10) and exceptionally high K concentrations (13 636 mg/kg to 52 897 mg/kg). The WFWP may be of a larger volume, less clay-like, appear to have less of a cementing potential and contain higher levels of C, P, K, C, Zn, Mn and B, and lower Na and Fe than WFWDE. Pre-processing of the material generally includes chipping of pruning canes and preparation of wine filter waste materials into finer particles. PHOTO 1. Wine filter waste derived from the use of perlite during winemaking processes. PHOTO 2. Wine filter waste derived from the use of diatomaceous earth during winemaking processes. Before composting wine filtration and grape waste materials should be stored as prescribed in the guidelines for wineries and bottling facilities (South African Wine and Spirits Board, 2014) and guidelines for the management of wastewater and solid waste at existing wineries (Van Schoor, 2005). The preferable period for composting using winery solid waste in the Western Cape is between September and March when the weather conditions are more dry and warm, if it is done in an open area without covering from the rain. The compost heap size if using a windrow composting system may be as big as 12 m3 (1.5 m high, 4 m long and 2 m wide) and as small as 3m3 (1.5 m high, 2 m long and 1 m wide). A heap that contain 40% WFW, may have each of the composting materials included as follows: 36% WFWP + 4% WFWDE, almost 50% PC (48%), 6% BS and 6% BSS. A heap that contain 50% WFW may have the materials added as follows: 45% WFWP + 5% WFWDE, 40% PC, 5% BS + 5% BSS. The rest of the composting materials may be divided into four parts, but the pruning canes into five parts when building up the heap in layers [layer 1 (PC), layer 2 (WFWP), layer 3 (WFWDE), layer 4 (BSS) and layer 5 (BS)]. Thereafter, the compost heap may be turned and watered if need be. Heat is a very important part of composting and temperatures can be evaluated by using a 1 m long steel temperature probe. The tip of the probe should be inserted halfway into the heap when the readings are taken. Rapid temperature increases are likely to occur during the first five to 15 days of the composting process if using winery solid waste. Real day temperatures varying between 50°C and 67°C were measured during the winery solid waste composting field study during the initial stages of the composting process. Generally optimum composting temperatures are between 49°C and 60°C. High temperatures are beneficial during composting as they aid in destroying pathogens and weed seeds. However, temperatures should be monitored closely and care should be taken that they are maintained at or below 65°C in order to avoid burning of the materials. Depending on the compost heap size, a heap can be turned often (one to three times a week) to avoid undesirable temperature increases, especially during the first five to 15 days of composting. Once the temperatures start decreasing, the heap can be turned once a week or once every two weeks. Moisture content should be maintained below 60% throughout the composting process. In order to determine water status of a compost heap, a sample can be taken from the centre of the heap, squeezed tightly by hand and if there is no water left on the hand and the sample is still in a ball-like shape, then the moisture status can be regarded as adequate. 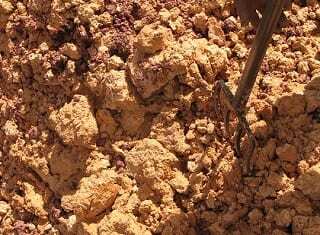 However, if the sample crumbles, the heap can be regarded as dry, and should be watered. A compost heap can be watered while being turned. Leachate should be collected as prescribed in the guidelines for the management of wastewater and solid waste at existing wineries (Van Schoor, 2005; Appendix 1). The drop in temperatures can be taken as a sign that the heap needs aeration. Turning of compost heaps will allow necessary aeration. Should waterlogging occur, especially after rains where the heap is not covered, the heap can be turned until it reaches the desired moisture state. Green materials and phosphate rich materials may be included in order to increase the nutritional content of the wine filter waste composts. Depending on the size of heap, composting material and moisture status during the composting process, compost can be ready between three to five months of composting using winery solid waste. Compost heap temperatures should be below 25°C when the compost is ready. As decomposed materials can only be used in fields if the final product is safe (Van Schoor, 2005), it is important to get a composite sample of the finished compost analysed for various parameters. 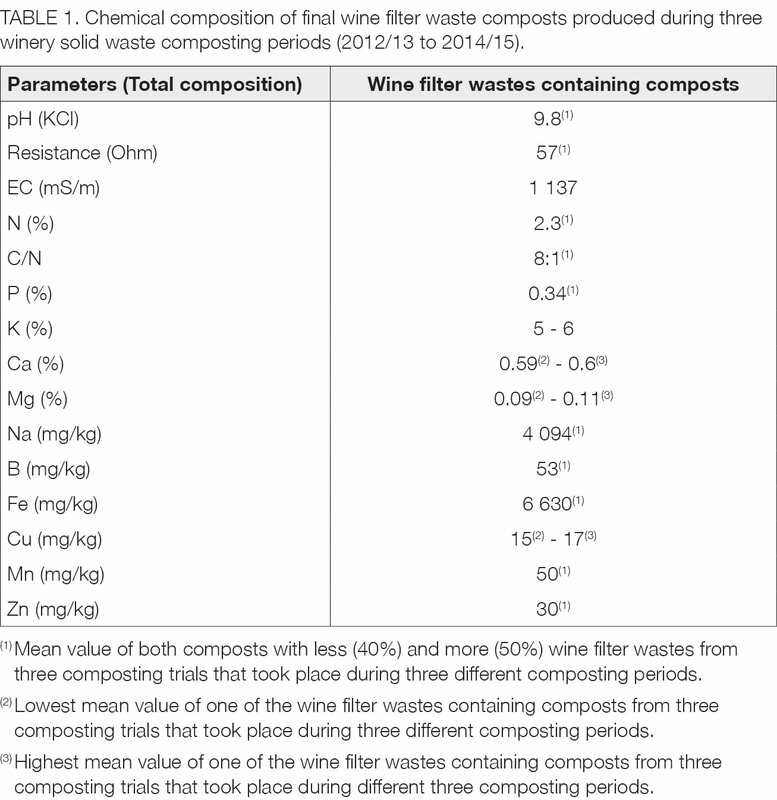 Chemical characteristics for winery solid waste composts that can be expected where wine filter wastes are included during composting and can be used for comparison purposes are indicated in Table 1 and 2. 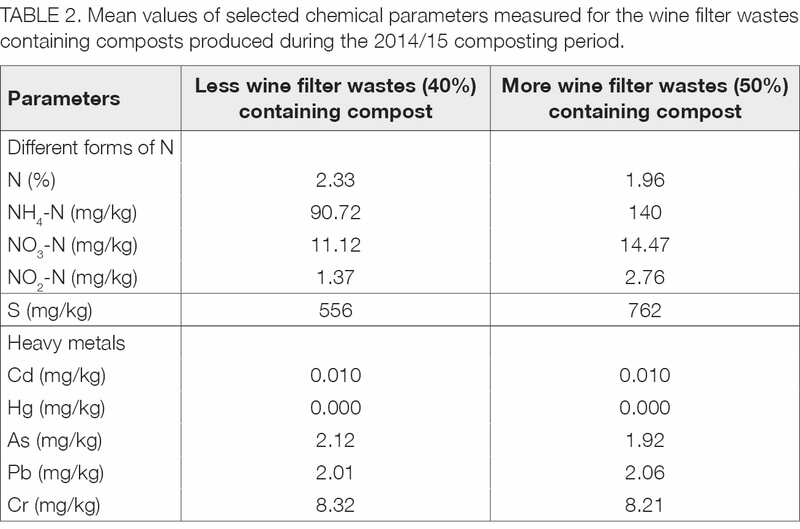 Composts made using wine filter wastes were alkaline (high pH), potential good sources of K and N, but with a low C:N ratio, rich in Fe, but have excessive Na and high B levels which should be monitored upon application and contained negligible levels of most heavy metals. It advised to take cognisance of the National Environmental Management: Waste Act (NEM:WA) and that the composting of waste is a listed activity and may require a license. Note that the Regulation for Waste Management Activities has been amended during November 2013 (GN No 921 under GG No 37083 dated 29 November 2013) which could impact on waste management practices. Category 6: The treatment of general waste using any form of treatment at a facility that has the capacity to process in excess of 10 tons, but less than 100 tons of waste. Note that “treatment” means any method, technique or process that is designed to change the physical, biological or chemical character or composition of a waste, e g the storage of organic/animal waste can also change the character or composition of the material – referred to composting. Also note that should the storage of general waste (including organic waste) with a capacity of more than 100 m3 takes place, the National Norms and Standards (NN&S) for the storage of waste (GN No 921 under GG No 37088 dated 29 November 2013; refer to table below) should be adhered to. If a waste licence is not required; the National Environmental Management Act (NEMA) stipulates that each person has a “Duty of Care” towards the environment. This means that, in terms of specifically the composting activities, one should ensure that the potential risk of ground and or surface water contamination is avoided. 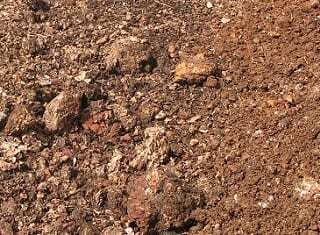 The composting site should be located on a flat slope (2 – 3%) on a clay or other suitable impermeable layer so that the leachate generated from the compositing activities can be contained. The site must be at least 100 m away from surface water resources. The way the material is stored must avoid seepage of leachate into the ground water. Runoff from the site must be contained, whilst external storm water must be diverted away from the heaps. Ideally any leachate (composting juice) from the site should be contained and re-used on the compost heaps. The risk of potential pollution could also be minimised by ensuring that only a small amount of material is stored at any one time. Other nuisance factors related to composting activities, such as flies, rodents and odours should be managed so that it does not cause a health risk or nuisance to the neighbouring properties. a) Demarcation of area where facility will be located. c) Name of owner of facility. g) Time frames for storage. a) Public health and environmental protection. b) Requirements in respect of existing servitudes. b) Procedures that must be applied to a particular type of work. c) Procedures for dealing with spillages and accidents. d) Appropriate use of protective clothing. e) Risks of the hazardous substances to employees’ health which they are likely to be exposed to. f) Sufficient number of employees must be trained to cover for leave periods, etc. g) An attendance register must be kept and signed by each employee at each training session. h) Only trained persons must be allowed to handle hazardous waste. f) Immediate action must be taken to contain spillage and prevent it from entering storm water drains or the environment. a) Containers, tanks, valves, piping containing hazardous waste must be inspected for leaks, etc on weekly basis. b) Registered engineer must inspect tanks containing hazardous waste at least once per annum. c) Secondary containment system must be examined once weekly or after each significant precipitation event. d) Ventilation systems, sump pumps, emergency alarms, etc must be inspected weekly. e) Inspection must include review of adequacy and accessibility of spill response equipment. f) Inspection and remedial action must be taken if environmental pollution is suspected. a) Must be conducted bi-annually. b) Official report must be compiled to report findings (submitted to external auditor). a) Must be conducted bi-annually by an independent external auditor. b) Official report must be compiled to report findings (submitted to relevant authority). c) Audit report must specifically state whether conditions of these standards are adhered to, etc. a) Reserves the right to audit and/or inspect without prior notification. b) All documentation must be available on request. a) An emergency incident must be reported in accordance with section 30 of NEMA. b) An action plan must be signed off by senior management. c) Complaints register and incident report must be made available to external auditor and relevant authority. d) External audit reports must be submitted to the relevant authority within 30 days from the date on which the audit was finalised. a) The following documents must be available: Number of waste storage containers; date of collection; authorised collector(s) and proposed final point of treatment/recycling/disposal. b) Any deviations from the approved integrated or industry waste management plan must be recorded. c) Records must be kept for at least five years. a) Site must be rehabilitated to the satisfaction of the relevant authority and according to the rehabilitation plan. b) Rehabilitation plan, including indication of end-use of the area, must be submitted to DEA for approval not more than one year prior to intended closure. c) The plan must indicate the measures for rehabilitating contaminated areas within the facility and the manner in which waste resulted from decommissioning activities will be managed. d) The owner of the facility, including the subsequent owner of the facility, will remain responsible for any adverse impacts on the environment, even after operations have ceased. Agricultural Research Council (ARC) and Wine Industry Network of Expertise and Technology (Winetech) for funding the research project. Wineries (Douglas Green and Koelenhof) for providing wine filter waste materials for composting. National Environmental Management: Waste Act, 2008 (Act No 59 of 2008) – Government Gazette No 37083, 29 November 2013 (Government Notice No 926). Retrieved from http://sawic.environment.gov.za/documents/2530.pdf. South African Wine and Spirits Board, 2014. Integrated Production of Wine: Guidelines for wineries and bottling facilities, July, 26. Van Schoor, L.H., 2005. Guidelines for the management of wastewater and solid waste at existing wineries. Winetech, South Africa. Retrieved from http://www.enviroscientific.co.za/pdf/WinetechWastewaterGuidelinesMarch05.pdf. Zingelwa-Masekwana, N., 2012. 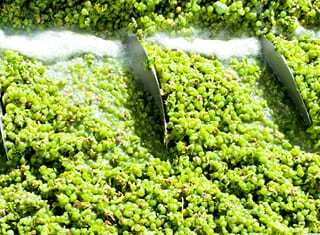 Management of fining and filter waste in wineries. WineLand, September, 115 – 117. – For more information, contact Reckson Mulidzi at mulidzir@arc.agric.za.